I recently got a new computer, I installed Code::Blocks there and moved my files to the new computer. But now when I use the debugger, the call stack does not contain the information about the file and line, which then also doesn't let me jump to the relevant location and thus makes debugging a pain. I thought the problem might be some old paths in the project files, so I did a search and replace on all my project files to fix all the paths. Unfortunately the problem persists. Can somebody please direct me towards what could possibly be wrong? I really don't know what to try anymore. While I was gathering screenshots of all my options I noticed the compiler option "Produce debugging symbols" was off on my compiler (*facepalm*). I could have sworn I tried turning it on, but apparently something must have gone wrong because now it did the trick! I'm just gonna leave the other information here anyway, maybe it will be useful to someone. I have rebuilt everything entirely on the new machine ( ). 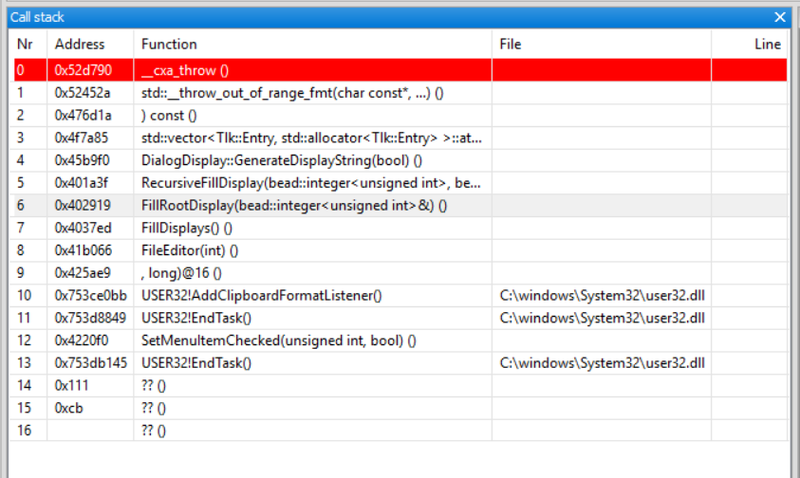 I have added the paths to the additional debugger search dirs. I'm using the Mingw-w64 compiler, and also their debugger. Same on the old machine. [debug]Copyright (C) 2018 Free Software Foundation, Inc.
[debug]This GDB was configured as "i686-w64-mingw32".